Lauren ended up in our bed last night...Let me explain. The Seeping Beauty play got changed to The Wizard of OZ, but practice was moved to Wednesday and Friday. Friday is Surf Camp with Ms Kristen. "Houston we have a problem" Lauren loves Surf Camp, and Ms. Kristen (who wouldn’t - she rides a motorcycle and wears a pink helmet), but Paul called (the director) and wants Lauren to try out for Dorothy. Still on board? But Lauren has never seen The Wizard of OZ, so we buy it on iTunes, download it (It took 8 hours), transfer it to our iPod for viewing on the TV. But the HD version that I download would not load on our iPod, because of course, it is HD. I promptly set up a chat with the folks at iTunes to get my $14.99 refunded (which they did) and redownloaded the non HD version which took only 3 hours. Now about Lauren in our bed. So we watch the movie last night and, of course, the wicked witch scared the bejesus out of her and when it was time to go to bed...you get the idea. Lauren tries out today for the part, but she has to decide between the Yellow Brick Road or the Deep Blue Curl. 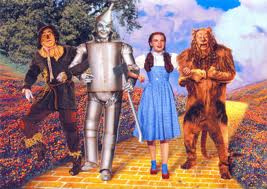 The Wizard of Oz is one of my absolute favorites! I always dreamed about playing Dorothy. Tell Lauren to break a leg!